Not quite a wagon or a true SUV, the Honda Crosstour adds a touch of versatility and all-weather performance to Honda's tried and true Accord platform. This wagonoid can send power to all four wheels via a fuel-efficient 4-cylinder or a more powerful 271-horsepower V6. 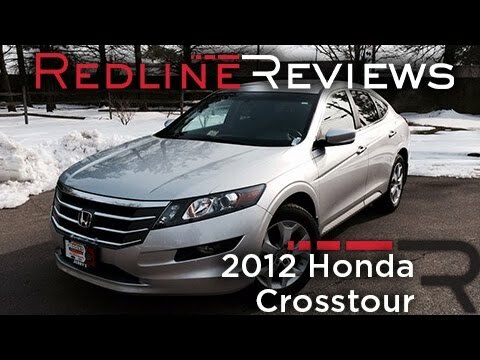 it you love the Honda Accord Sedan but want something a little more sporty and practical with added usability; then the 2012 Honda Accord Crosstour is for you. The base model 2012 Honda Accord Crosstour starts at $30,340. The engine is a strong 3.5 liter V-6 that features i-VTEC. Power figures are 271 horsepower and 254 lb-ft. of torque. The 2012 Honda Accord Crosstour comes in both 2WD and 4WD. Fuel economy ratings are 18 MPG in the city and 27 MPG on the highway for the 2WD model. The space that every seat has is tremendous. I love that it sits high for a car. The car is spacious, almost like a small SUV. Me and my wife love the comfort. We go to dinner regularly with my sister and parents. We use to drive together in the Kia optima and were a bit squashed but now that we got our Crosstour we always use it and everyone enjoys the ride comfortably. I couldn’t be happier with this car. I am honestly not sure how this car is not more popular. I love my Honda crosstour. I bought it new in 2012 and I have not had any regrets or problems with this car. It takes very little maintenance, has good gas mileage, and still looks good on the road after 5 years. This was my first Honda purchase so I previously didn't know what to expect. I plan to pass it down to my teenage soon, I trust it that much! HONDA IS RECALLING CERTAIN MODEL YEAR 2012 ACCORD AND CROSSTOUR VEHICLES. THE DRIVER-SIDE OR PASSENGER-SIDE SIDE CURTAIN AIRBAG INFLATOR MAY NOT HAVE BEEN MANUFACTURED ACCORDING TO CORRECT SPECIFICATIONS. IN THE EVENT OF A CRASH, THE SIDE CURTAIN AIRBAG MAY FAIL TO DEPLOY, INCREASING THE RISK OF INJURY. HONDA WILL REPLACE THE DRIVER'S SIDE OR PASSENGER'S SIDE SIDE CURTAIN AIRBAG AS NEEDED FREE OF CHARGE. THE SAFETY RECALL IS EXPECTED TO BEGIN ON OR ABOUT FEBRUARY 10, 2012. OWNERS MAY CONTACT HONDA CUSTOMER SERVICE AT 1-800-999-1009. Honda (American Honda Motor Co.) is recalling certain 2008-2012 Accord, 2010 and 2012 Accord Crosstour, 2006-2011 Civic, 2007-2011 CR-V, 2009-2012 Fit and Pilot, and 2010-2012 Insight vehicles that received replacement passenger frontal air bag inflators. One dealership may have incorrectly installed the replacement air bag inflators. Honda will notify owners, and dealers will replace the passenger frontal air bag module assembly, free of charge. The recall is expected to begin October 1, 2017. Owners may contact Honda customer service at 1-888-234-2138. Honda's numbers for this recall are O07, Y0A, N06, G05, M04, Y01, and O09.